Super simple to make and the salty, lemony, buttery taste is to die for! Heat butter and olive oil over med-high heat in a skillet until butter is melted. Place fish in the pan and cook for 3 min until brown on bottom. Flip over and cook 3 min more. Chop olives and put in the pan. Squeeze juice of the lemon into the pan. Cook for 3 min or until fish is done. 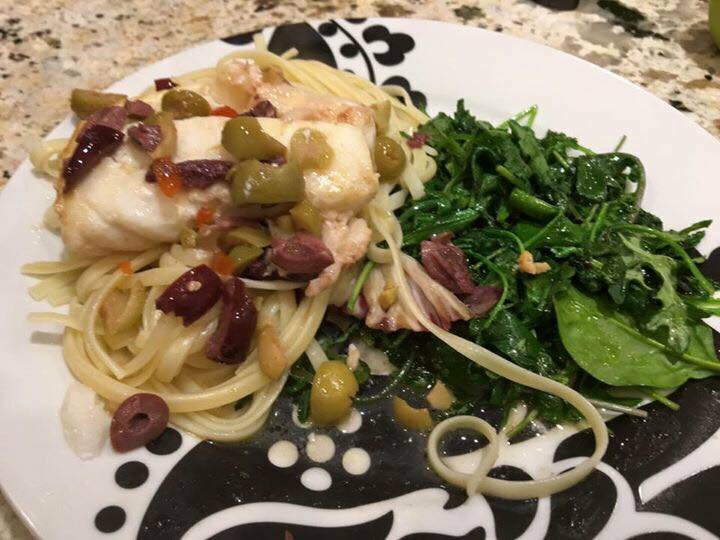 Spoon sauce with olives over fish. To add greens, sauté your favorite mix of kale, and spinach in a tsp of olive oil and a chopped clove of garlic for a couple minutes, just until greens turn vibrant in color. Season with salt. They're delicious with the extra sauce. Enjoy!